Behaviors come in all shapes and sizes. There is avoidance, vocal aggression, physical aggression, self-abuse, rude comments, bowel issues, sleep issues, food issues, and the list goes on, and on, and on. Many of you are in a battle with behaviors. Last year we had a Speech Pathologist and a Developmental Therapist coming to our home for our son. They suggested we bring in Patrice, a Behavioral Specialist. After visiting our home one time, she said Jeremiah exhibited behaviors. Well, I was not a happy Mama. My son was well behaved, especially when considering where he came from and what he deals with. I equated much of his crying (behavior she was referring to) with his lack of understanding language (he’s nonverbal). Jeremiah is developmentally delayed and has Autism, but does not struggle with many of the attachment issues our daughter does. Before school began, I attended a meeting with Patrice and Jeremiah’s other therapists. I mentioned, as kindly as possible, that Patrice said Jeremiah exhibited behaviors. One woman said, “He does.” A few minutes into this roundtable discussion, I found out they all believed behaviors aren’t a bad thing, but are a child’s way of communicating. 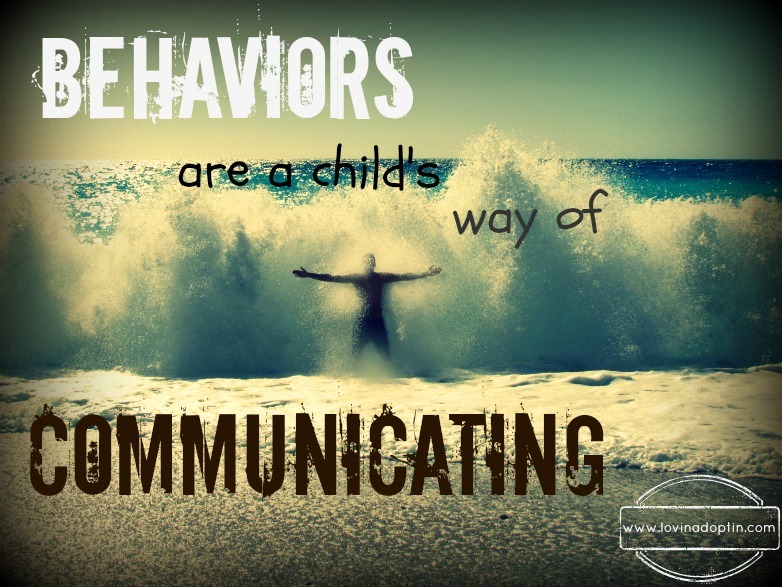 If we look at our child’s behavior in this way, it alleviates some of the frustration we feel when they act out. We can also see that our child’s behavior isn’t about us, which so many parents of hurting children tend to think. Our children are telling us something. They are responding to triggers that send them back to their days of trauma, neglect, and abuse. They are trying to control their environment because they don’t believe they will be safe if they don’t. like a wave, our child’s behaviors come from deep within. I listened to a webinar on The Attachment and Trauma Network that was very enlightening. In regards to a hurting child’s behavior one of the speakers said, “If your child had acid reflux and threw up, it would be because of the acid reflux. So it’s the same as when your child tries to ruin things when they are going well, their brain is more comfortable with the chaos, the calm scares them. Their body is reacting, they aren’t doing it because of you.” This internal response to the chaos in their brain produces behaviors that we don’t like. Why can’t behaviors be quickly fixed with consequences, discipline, and rewards? For our children to create a lasting behavior change they must bond with us (see the end of this article for links to posts on bonding). When our children bond with us, their brains are forming connections that previously did not exist. Before our children bond, their brain is disconnected. In The Boy Who Was Raised as a Dog, Dr. Bruce Perry says, “Because of the enormous amount of information the brain is confronted with daily, we must use these patterns to predict what the world is like. If early experiences are aberrant, these predictions may guide our behavior in dysfunctional ways.” Our children will not behave properly when their brain is disconnected. Consequences, discipline, and rewards used in the right way are elements that help our kids develop, but when our main focus is on those three facets and not on bonding, it’s like placing a new board over a rotting one. The rotting board doesn’t go away, it’s still festering underneath, it will continue to rot until it’s replaced. I equate the rotting wood with the beliefs our children have formed about life and themselves. When our child bonds with us, we are replacing those old ideas with new theories of themselves (they are lovable), their caregivers (safety and love), and life (they don’t have to control everything). When all these pieces begin to come together you will see your child letting go of their control, which will in turn change some of their negative behaviors. This entry was posted in Uncategorized and tagged abuse, behaviors, bonding, consequences, mood disorder, neglect, ODD, PTSD, RAD, trauma. Bookmark the permalink.